Happy 2018 stars and sunbeams! I really hope you enjoyed Christmas and that the New Year is cutting a cool groove for you so far. 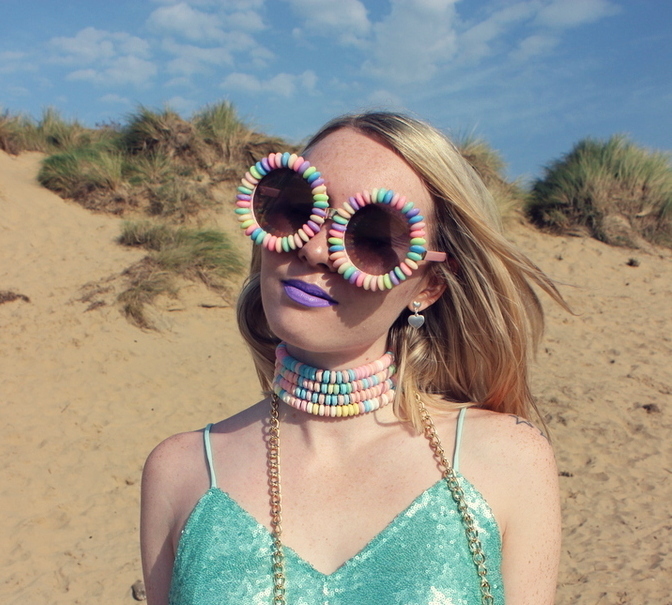 After a bit of a break I'm back to blogging and looking forward to creating more colourful fashion blog posts for you this year combined with a few more of those honest/girl talk/advice blog posts that gained a great reaction from you in 2017. I'm not keen on resolutions or January being looked upon as the only month to set goals, but I thought it was about time I gave you a little update on how life looks and what goals I've set myself for the year ahead. So, let's do this thing! 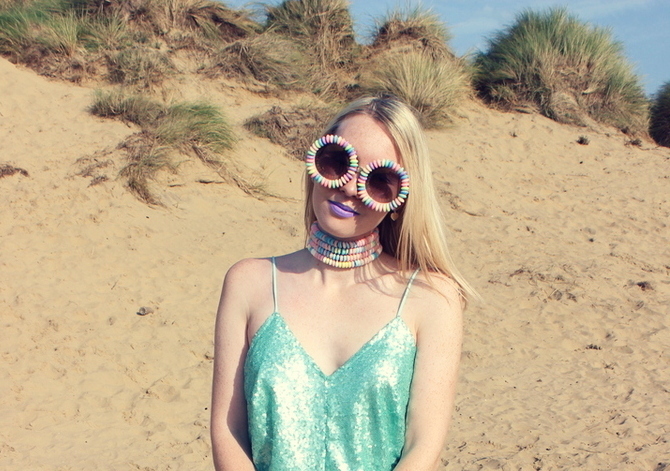 I thought this sparkly sugar dose of an outfit would be a great way to jazz up January. 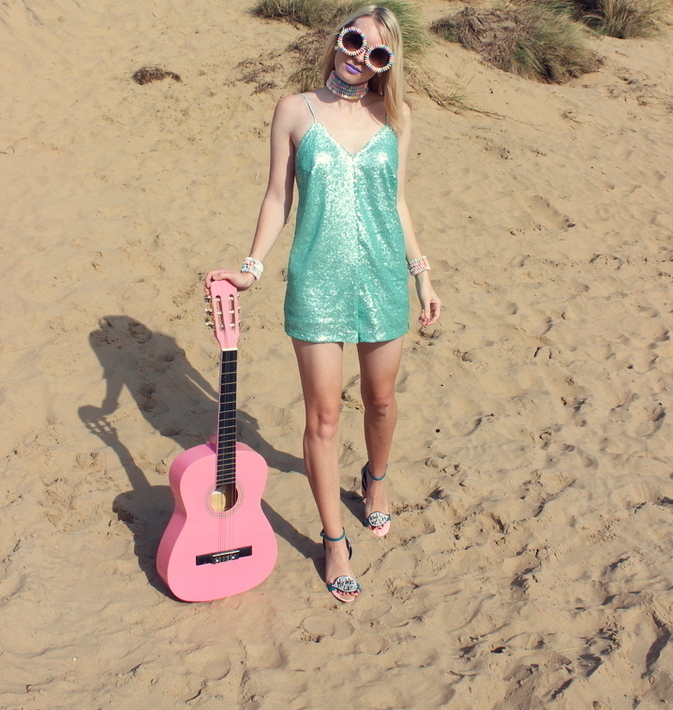 I decided to funk up the playsuit with my pink guitar and a shedload of sugar. 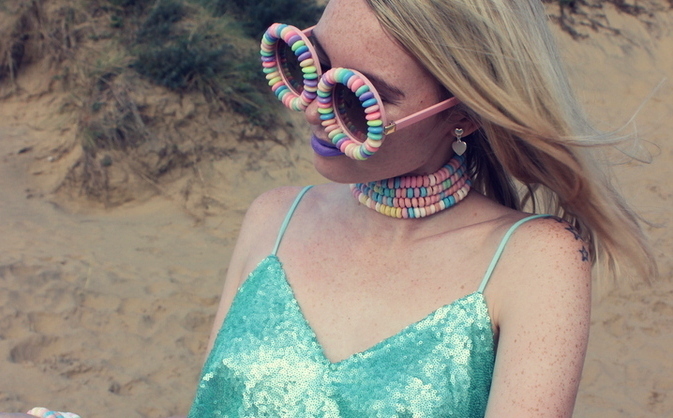 The bracelets and necklaces are a real 90s throwback, and this beach shoot definitely has to be one of the dreamiest, we had a real blast! 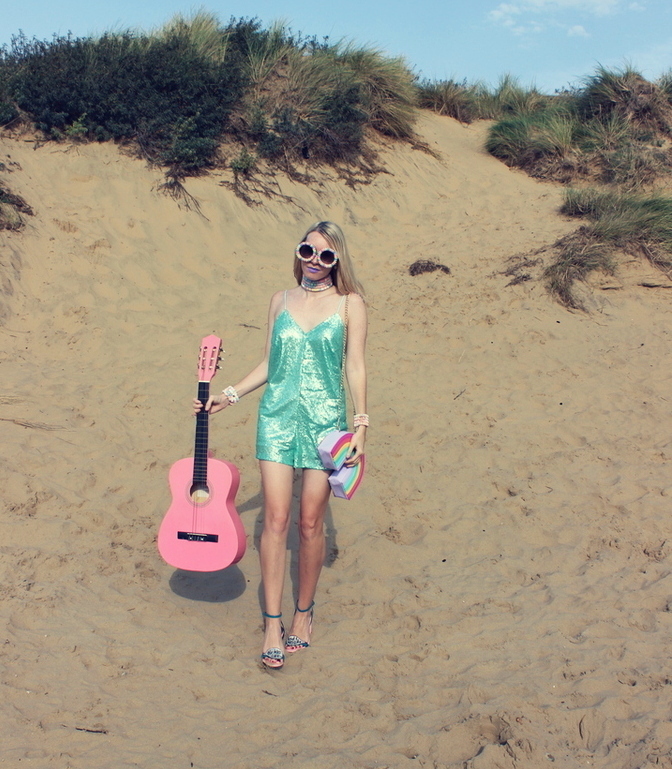 The strappy peppermint sequin playsuit is from the Aladdin's Cave that is Motel Rocks. If you know me you'll know I love a bit of Motel Rocks magic and love to rock their sequin dazzlers every season. The heels bring home all the slogan sass "he was like... and I was like..." quotes Graham every time he sees the shoes out of their box. The heels hammered at my heart when I first spied them on the asos website and you may have seen me showcasing them in my unicorn disco Halloween outfit post. This was a target for 2017 and I'm almost there. In 2017 I rewrote the start and middle sections of my book from scratch and I'm literally on the last few chapters now before it'll be a completed book ready to start sending off with the aim of publication. Despite not quite hitting my target, I'm really proud of practically re-writing most of a novel that needed a real refresh and a new perspective on the manuscript I'd worked on for 7 years. Now I'm finally happy and content that I've got a novel ready to send out to the world. I've come too far now not to get it out there and I hope to succeed. Once my novel is finished I want to get a butterfly tattoo to celebrate. I'm after something iridescent and shimmery, whilst being colourful in a subtle toned down way. The butterfly will symbolise flight, freedom and a new height I'm hoping to reach with my book and other lifetime goals I'm hoping to hit. It will feel relevant to my novel because butterflies definitely run a course through my book, whilst myself and the main character both have star tattoos inked on us to symbolise strength. I hope to get it in the summer. If you follow me on Instagram then you may have seen I often talk about my anxiety and mental health over on my insta stories. I really enjoy Instagram as a platform and reactions have always been positive and kind when I've opened up about issues that have taken courage to talk about. I've spoken about suffering from bullying in the workplace, my experiences with counselling, health anxiety, going for my first smear test, toxic friendships and many other topics. Due to a lack of information and a lack of awareness I spent years feeling ashamed, isolated and frightened about what was wrong with me, all due to anxiety and mental health being a taboo subject and not being discussed or talked about nearly enough. I'm determined to speak out, be open and try and raise as much awareness and provide as much support on this blog by talking about my own experiences as I can. We're looking for a place together and I can't wait to live with my partner and the kitties; Muffin and Bamf. It's not been the easiest time and I couldn't be prouder of how Graham's handled everything lately. He works so hard, only wants everyone to be happy and is always nothing but supportive of my blog, book and anxiety despite having stresses of his own to handle. I feel very lucky and blessed to have him in my life and can't wait for this new chapter together. Ideally the next logical step for me alongside my blog would be to start a proper Youtube channel although I've always wanted to wait until I had enough money to invest into it properly. I'm not sure if this is something that I'll end up doing this year but nevertheless it's definitely an aim for the future. After suffering badly with a surge of anxiety from February to April last year I realised that despite feeling vulnerable, I wanted to be more honest and open by discussing and featuring more important topics on the blog. There are so many that aren't talked about enough and I really want to try and change that. I want to discuss smashing low self-esteem, something I suffered badly from throughout my teenage years. Expect more honest, frank, straight from the heart posts which I'm excited to build up to, whilst of course, keeping the blog about colourful fashion too. Adore this dreamy outfit babe! Your shoes are just the perfect touch! I love all the goals you have set and I know you will do so much and more in 2018! Happy new year love! Happy new year beauty, I can not wait to read your book!!! Looking forward to more honest blog posts too, something I plan to work on too in 2018. Also yaaaasss to YouTube, do it!! I'm eyeing to get my tattoo soon as well. It was so creative and full of succes year for you, I'm impressed! Wow, wonderful goals you have set for yourself. So good that you opened up about your anxiety on Insta and the blog. I did the past few years on my blog and it felt really good to talk about my experience with PTSD and anxiety. I felt good about helping others with similar problems. One of my close friends that suffered from anxiety didn't even know that about my own struggles, and she felt so much better after reading about it from someone she knew. So good that you are openning up and helping others Sophie. You look gorgeous in this metallic jumper, totally rocking it!! So great that you're taking a big step with your boyfriend and almost done with your book. I'm really excited for you! Hope this year is an amazing one for you and that you accomplish all that you set out to do. Happy New Year. Your sets of photos are so outstanding. Love this gorgeous outfit. Congratulations on writing a book! That is absolutely incredible. I am with you in talking about anxiety. It is a topic very close to me also and I have very similar goals. My life has overall been going a lot better in the last couple of years but the one anxiety I cannot conquer is being able to fly on a plane. So I really want to set that as a goal for this year. Happy New Year to you beautiful girl. 2018 is looking set to be a fabulous year. Moving in with the BF and kitties AND submitting your manuscript. That is huge, Congratulations. I dream of having my own tales published. I started my journey around six years ago but I keep flipping between stories and ideas, do I focus on being a published author or move to scriptwriting, or both. I'm a hotpot of ideas and confusion when it comes to writing. 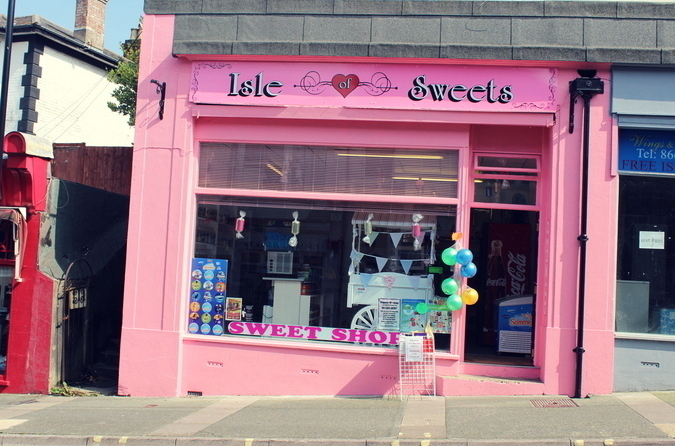 I suppose the ideas will serve me well when I need to churn them out eh ;o) hahaha! Girl can dream. Good luck with this, it is such an achievement to have created a story and to find the courage to send it off. I truly wish you all the very best. I also love how you're trying to share more about anxiety here. You're right, it is not talked about enough and ridiculously still such a taboo and stigma surrounding it. I had my first real descent into "madness" three years ago and sadly found myself all alone dealing with this. I didn't get the help I needed from my doctor and friends weren't really around either (maybe I pushed everyone away?). It was tough, so damn tough but I got through it and I'm so damn proud of me. Honestly I don't know how I managed back then and I always said that I wanted to share such experiences on my blog. But I never did. I think (and still do) I was worried about not being received well or being overlooked in the online world too since that was my experience in the outside world. Stuff like this does need a voice-more voices-to get people talking and accepting and loving people dealing with it. It's crazy because soooooo many people are effected by anxiety! Urgh. You are such a babe!!! This playsuit is absolutely dreamy! Good luck with finishing your novel! That is going to be such an incredible feeling once you've finished it :) Love the idea of the butterfly tattoo, so special and meaningful! My biggest aim for 2018 is to work on my photography and be the best I can be! Ugh yes girl! I would love it if people would start being more vocal about anxiety and mental health issues. I need to take that advice myself though because I still find it quite difficult to vocalise or put into words my own struggles. I love this outfit, it is so fun! Hope you have an amazing 2018!